Bitcoin enthusiasts have experienced a rude shock yesterday when it lost 50% of its value in an instant. China has decided to block new deposits of Bitcoin, and this news had a ripple effect across the globe as its value came down from $1200 to $550 within few hours. At the time of writing this post, Bitcoin was trading at $550 at Mt.Gox, which is considered one of the largest Bitcoin exchanges in the world. People’s Bank Of China which is the central and most powerful state controlled bank in China saw traces of money-laundering in the usage of Bitcoins. Since past two weeks, apprehensions existed that China may regulate or ban its usage considering that then country has very strict policies related to currency flow and money laundering. As of now, there are around 12 million Bitcoins in circulation all over the world, and this major dip in its value may trigger something even bigger. Like Bitcoin, there are other virtual currencies as well, and all of them took a major hit – Here is a look at top 5 virtual currencies and their existing rates. Bitcoin is world’s first “decentralized digital currency”, which was launched in the year 2009 by a developer who called himself Satoshi Nakamoto. It is an open-source, peer to peer payment network, termed as “cryptocurrency” as it uses the highly scalable and secured public key cryptography for its security. There is no physical currency available, but its users can send payments by broadcasting digitally signed messages which can easily transfer the ownership of the currency. The verification process is decentralized as a set of specialized computers and algorithms time-stamp each transaction using a proof-of-work system. This complete A-Z of Bitcoin post will help you understand more about the technical aspects of bitcoins. There is a tremendous excitement in the Indian technological world and venture capital market regarding Bitcoins. Gaurav Burman, who is the managing director of Elephant Capital recently made an undisclosed investment in itBit Pte Ltd., a Singapore based Bitcoin exchange, as he picked a minority stake in the venture. If Gaurav, who is associated with Dabur family and coming from a traditional business background, has shown interest in Bitcoin startups, then it gives a general impression about Bitcoin’s excitement in the Indian VC scene. Alok Mittal from Canaan Partners has also invested around $3.25 in itBit and more such investments are expected in coming days. There is another startup in India called Seven Digital Cash LLP, based in Gandhinagar, Gujarat which buy and sell Bitcoins via its website BuySellBitco.in. One of the most important reasons which make Bitcoin very risky is the value of currency. As there is no ‘standard’ value associated with a Bitcoin, it trades like a stock or commodity, and often has been compared with gambling. Just one single news from China made it lose value by 50%. Such massive volatility makes its usage pretty limited and risky. Money has only one purpose: It helps in buying and selling and completing transactions. When we buy 1 kg of sugar, we expect 1 kg of sugar in the packet. One hour has 60 minutes, and 1 rupee has 100 paisa. But with a Bitcoin, nothing is assured. As there is no regulatory authority governing its usage and flow in the market, it is like a wild wild west of financial world. When you spent Rs 1000 to buy Bitcoins, you can be never sure how much value you are actually getting back. One thing is sure, whatever Bitcoin is, it is not money. Several bank associations around the world have warned about Bitcoin usage. Arguments and counter-arguments regarding its risky nature is being discussed right now, all over the world. Issues of money laundering and Bitcoin usage by drug cartels is already raising concerns, as there would be no evidence left of any transaction using this decentralized currency. How India regulators deal with Bitcoin would be interesting to watch and follow. What is your opinion of Bitcoins? Can we bring them into mainstream financial world? Please share your views by commenting right here! 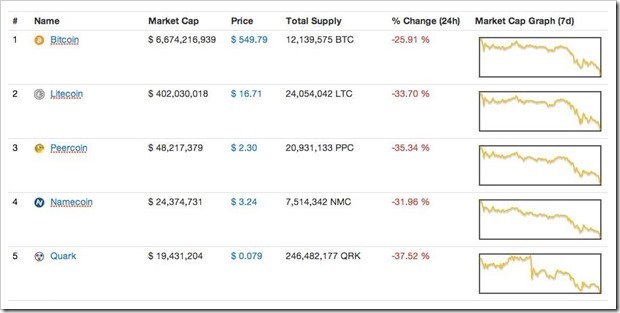 "Bitcoin Value Reduced To Half As China Bans New Deposits", 5 out of 5 based on 1 ratings.